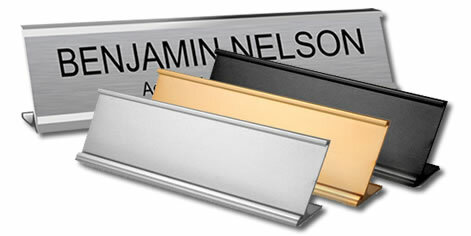 Traditional aluminum name plate sign holders in rose gold, silver or black are available for desks, counters, corridors, walls and doors that will enhance your engraved signs and name plates. These aluminum frames come with an engraved plastic name plate that are available in a variety of color combinations. Engrave your logo, text or graphics. Standard holder frame sizes are, 1 x 8 inch, 2 x 8 inch, 2 x 10 inch, 2 x 12 inch. Also available are specialty holder frames like corridor brackets, counter bases, directory signs, etc. Common Wall sign holder sizes are 1 x 8 inch, 2 x 8 inch and 2 x 10 inch, other sizes available. Highly polished and anodized in Polished Rose Gold or Polished Silver or Matte Black. Cubicle holder attachments are available in a custom sized metal bracket. Great for displaying your name plates on doors, walls, or any flat surface. The wall mount holder has two openings that allow for the name plate to easily slide in and out. Common desk sign holder sizes are 2 x 8 inch, 2 x 10 inch and 2 x 12 inch, other sizes available. 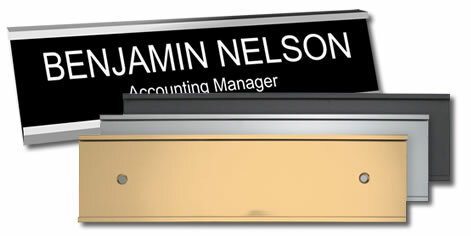 Executive style desk holders are a simple and professional way to display your name plates. The name plates easily slide in and out of the holder making it simple to change as needed. 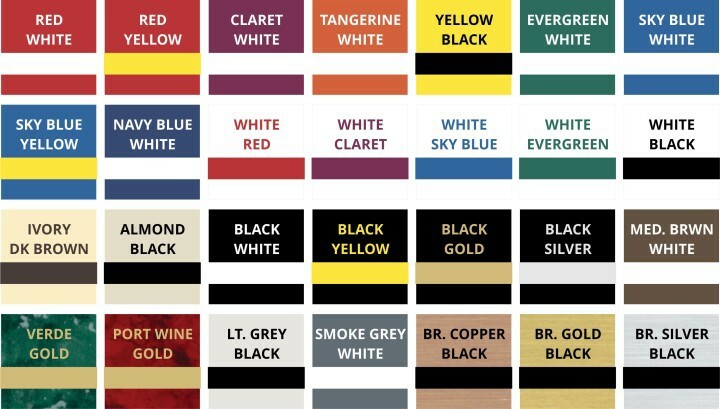 Create building directory signs but combing multiple wall holders together, plates can be securely fixed with double side tape or can be easily switched but sliding the plates in or out as required. Not recommend from tamper prone areas. Just wanted to thank you for the excellent job you did on the stamp for our wedding. We are very pleased with the quality and price.